Sometimes called inserts, inset wood burning stoves are those stoves that sit flush, or almost flush, to your chimney breast, either into a purpose built “marble backplate and surround” or straight into a hole in the wall (for a more minimilist look). They are useful when you do not wish the stove to protrude into the room (maybe when the room is small). Inset wood burning stoves can, for stove fitters, be a bit of a pain: retail outlets promote the fact that an inset stove “will slide neatly into your little existing fireplace with little fuss”. It might do but often it will not. There are also different types of inset and varying methods of fitting. From a fitter I know: “Be careful with the non convection inset they give off no heat, unhappy customers are not great, I won’t fit any unless there flexi lined and have a convection box”. 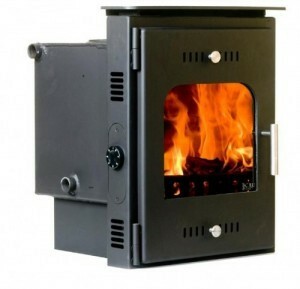 An inset stove is usually a metal box with a front face attached, the front face acting as a flange. The box part at the back slides into the recess under your chimney whilst the flange, being wider, seals the stove against the wall. 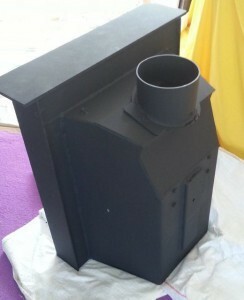 Pevex inset stove. This stove has a removable collar (that thing on top) that can be fitted from INSIDE the stove and this makes life so much easier. So you can connect the collar to the liner in the fireplace whilst the stove is still in the room, then slide the stove into place and connect the collar (with liner attached) from inside the stove. If the collar is not removable then you have to slide the stove in and make a hole above the lintel so you can get your hands in to connect the liner. Inset stove flanges can be shallow or deep, built into the stove or screwed or clipped on afterwards. Cassette stoves are slightly different, having a second thin layer of metal around the firebox this trapping hot air between the layers which feeds out through air vents in the stove’s flange. But fitting is what we are here for. Let’s get right back to basics. Firstly, you are going to need some kind of recess to slide the stove into. 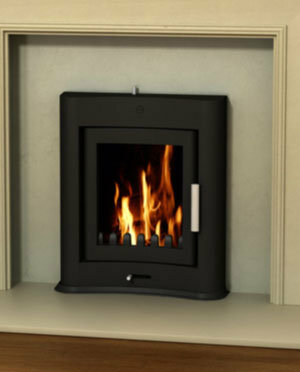 Note that inset stoves and cassette stoves must sit on full constructional hearths (basically five inches of concrete – see hearths section). If you are in the fireplace area you should have this concrete base area (five inches thick). Don’t worry if not, stoves can be raised up above floor level by siting them on a raft lintel or brickwork (you can even put them high and build a log store underneath as long as you observe the correct distance to combustibles). If you are NOT fitting a stove with “marble back-panel and surround” (back panel and surround shown in the first picture on this page) then your recess has to end up exactly the right size and this can take some doing. So if not fitting back panel and surround check out steps 1-5 (otherwise skip 1-5). 1. If the existing recess is exactly the right size (height, width and depth) then you are very lucky – you might of course have measured your recess and chosen accordingly. Insets are often designed to fit exactly into a small open fire recess, although some excavation of the fireback may be necessary (Google “fireback” in Google images). 2. If the existing recess is too narrow then you will have to break it out and make it wider (if you can of course, see opening up a fireplace). This may mean that you have to do a full breakout to the builder’s opening/original fireplace opening. Why? 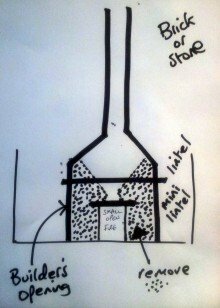 Because often a small open fire only has a small lintel and when you open up the hole width ways then the lintel falls out and some overhanging brickwork falls away as well (read opening up a fireplace first). You might be able to insert another small lintel or you might find it easy to proceed to a full builder’s opening excavation (sometimes once the infill, as shown in the dotted area in the left pic, starts to fall then then you struggle to keep it in place whilst adding the new small lintel – it depends on what materials the builder used). Note that a small open fire is usually one small recess inside a larger “builder’s opening recess”. In this case there are two lintels. Making the small recess a tad bigger may mean the lintel falls out and the bricks above it fall. 3. If the existing recess is not high enough then you will have to move the small lintel higher. Lintels above small open fireplaces can be concrete but they are often metal strip or thick metal rod. Read this whole inserts section before fitting a new lintel so as not to position any new lintel in the way of your stove or liner. 4. If the existing recess is not deep enough and you cannot excavate further (you are burrowing into next door maybe?) then you should choose a different stove (or create a false front to your chimney breast and then it’s possibly time to ask a builder in for a cuppa). 5. If the existing recess is too wide or/and too high (i.e. you have excavated to the builder’s opening and it is now too bloody large) then you have to make the recess smaller, to the size required in the stove fitting instructions. You can do this by adding building material to the inside left and right walls (e.g. bricks) and by moving the lintel. This is not always easy as the hole has to be so exact so as the stove slides in AND the flange covers the hole. You can use bricks to narrow the recess and build up the thickness of the left and right inner walls with layers of 12mm concrete board for the final few cm. If you are going to fit a purpose built surround and back plate then things get a whole lot easier. Just make sure that your recess is larger than required and then order your back plate with the correct recess cut into it coupled with a surround to fit your requirements. Obviously the surround and hearth have to complement each other (you don’t want the legs of the surround being wider than the hearth!). 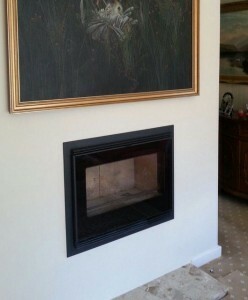 Try www.oerfireplaces.com for more info. Make sure you specify for multi fuel as back plates are designed to take the heat. Avoid wood surrounds unless you know that you are legal with regard to distance to combustibles. From a fitter I know: Be careful with the non convection inset they give off no heat, unhappy customers are not great, I won’t fit any unless there flexi lined and have a convection box.